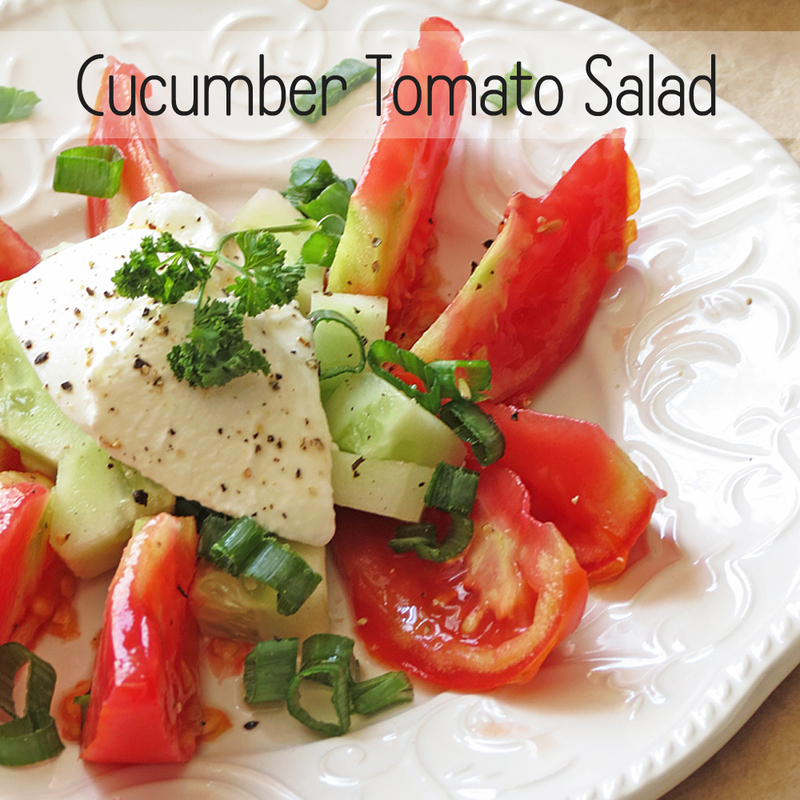 Today’s cucumber tomato salad recipe is courtesy of our contributor Ilona from Ilona’s Passion. 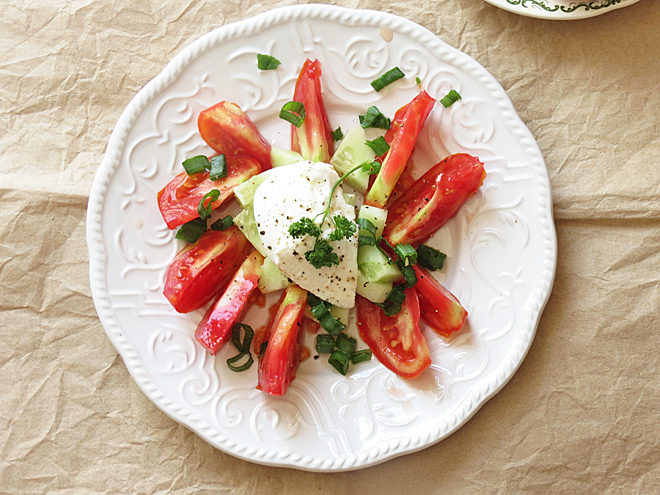 Easiest as possible and the BEST Cucumber Tomato Salad with a dollop of sour cream. I hope you will enjoy this tomato salad like me. I know it is so simple, but the taste is incredible. Believe me. I’m not sure if you had this combination before but this recipe is very common in Europe. I remember the time when I ate this salad as a child for supper. It was the best salad for me. We usually ate it with a slice of bread and butter. OMG! Yum, I cherish this time. No matter what I always come back to this time and make my cucumber tomato salad. 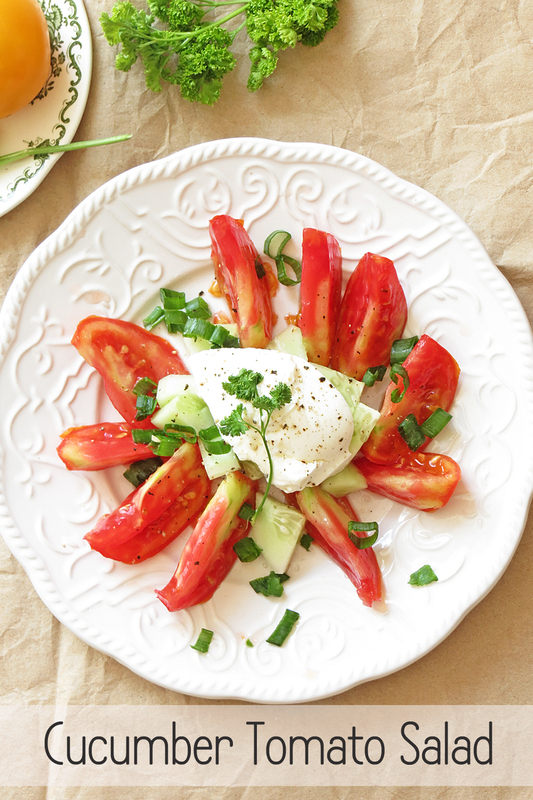 The tomato salad is perfect for lunch or as a side dish for dinner. I serve that way sometimes at home. Combination of tomato, cucumber and shallots is the best. For stronger flavour diced onions can be added. Everything marinates well with sour cream. Don’t be discouraged by the simplicity of the recipe. It is very delectable! Apparently, I am lately into meatless dishes. I hope you have seen my previous meatless recipes Zucchini Kale Pasta or Basil Roasted Red Potatos. They are so delicious same as my tomato salad. Also, they are very easy recipes. Because, sometimes our time is limited so we love to make quick tasty dishes. Peel cucumber and cut into small pieces. In a small bowl mix tomato, cucumber and shallots. Season with salt and pepper. Add sour cream. 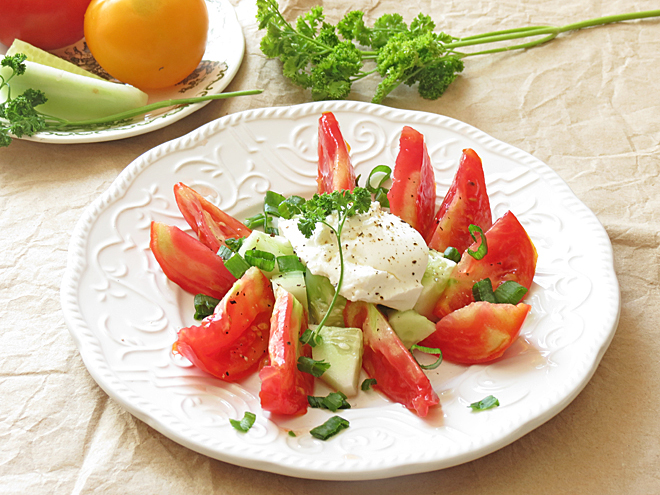 Have you tried Tomato Salad before? How did you like it? If you love easy salad recipes, you might also like to check out this awesome salad book, with so many recipes that you could have a different salad for every day of the year! Ilona is a stay home mom of two boys, blogger at Ilona's Passion and designer of printable invitations. She spends most of her days with her boys or in the kitchen where she cooks and bakes. This looks so good I love salads – Thanks for linking up to Pin Worthy Wednesday, I have pinned your post to the Pin Worthy Wednesday Pinterest Board. 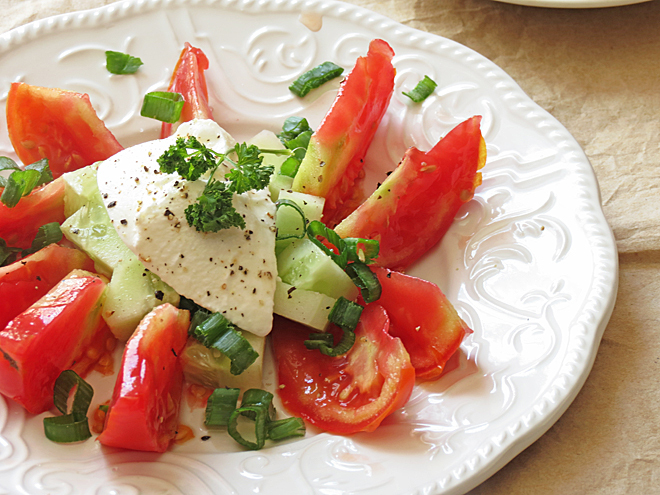 Tomato and cucumber always make a great combination. Thanks for joining us on Oh My Heartsie Girl Wordless Wednesday!